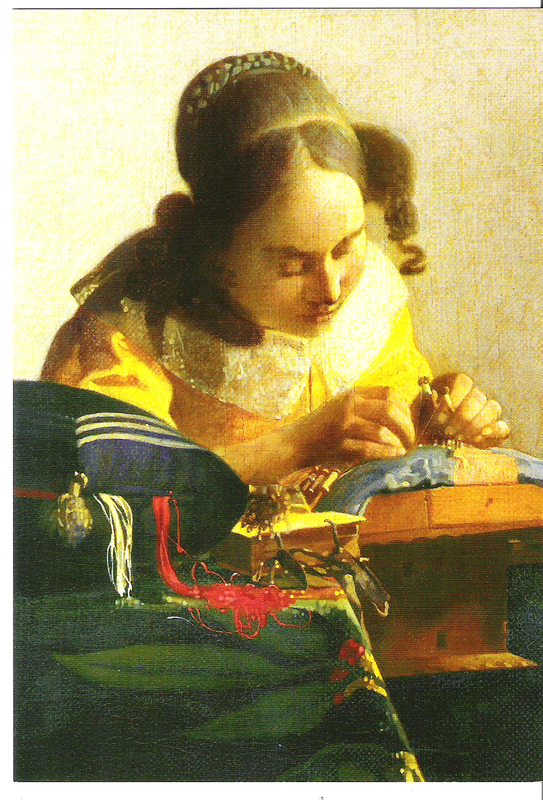 My first introduction to Johannes Vermeer was his smallest painting, Lacemaker (1669), in the Louvre Museum. In fact, as I raced through the Louvre dragging my friend Michelle behind me, bypassing the Mona Lisa, Venus de Milo, Rembrandt’s masterpieces, etc. when we reached our final destination she exclaimed, “We ran all this way just to see this?” However, soon we were both hooked and wanted to learn more about this exceptional painter. 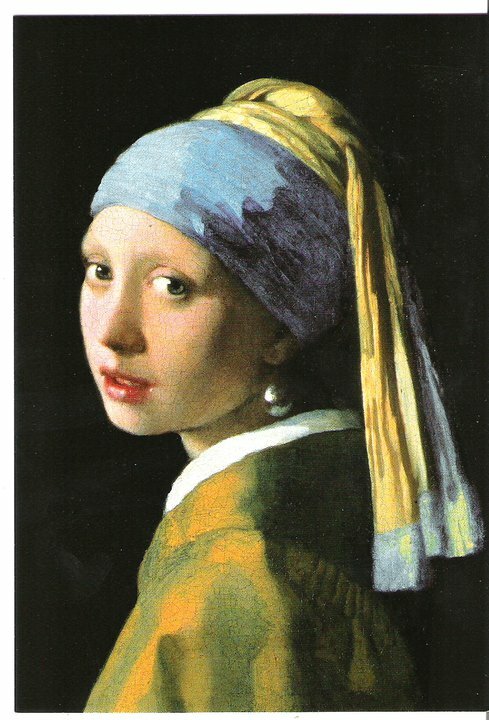 There are only 36 generally accepted Vermeer’s in the world and they are divided between Europe (22) and America (14). 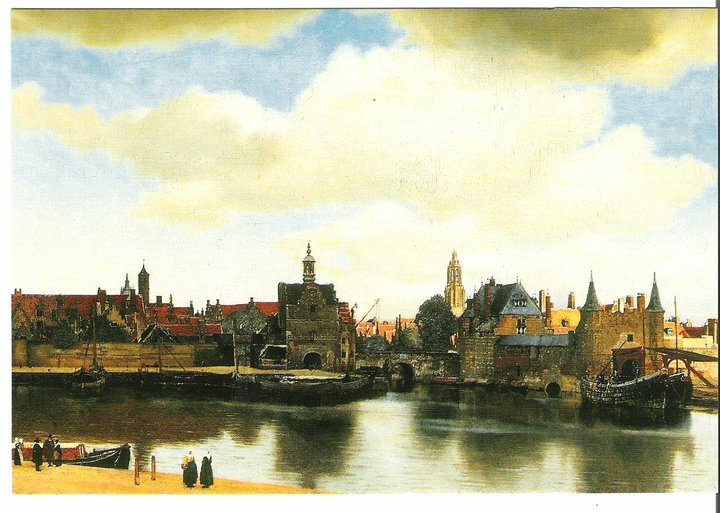 Vermeer was born in 1632 and lived most of his life in Delft, which is in the province of South Holland, Netherlands. This historic, rural village is one of the most beautifully preserved, bucolic places I have ever visited. It originated in 1246 from House of Orange (William the Orange is buried in the Nieuwe Kerke) but a large part of the city was destroyed by an explosion in 1654. 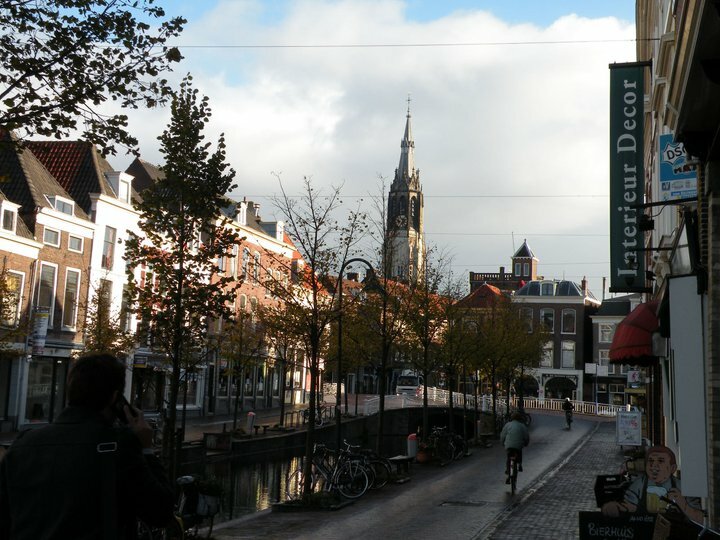 Vermeer’s painting of the Delft has preserved the former town. The main mode of transportation is the bicycle and you will see the villagers going to work, school, and exercising throughout the day. We even saw a teacher and her students riding their bikes on a field trip. The air is crisp; the sky is the same vibrant blue that Vermeer painted hiding behind the white/gray clouds. 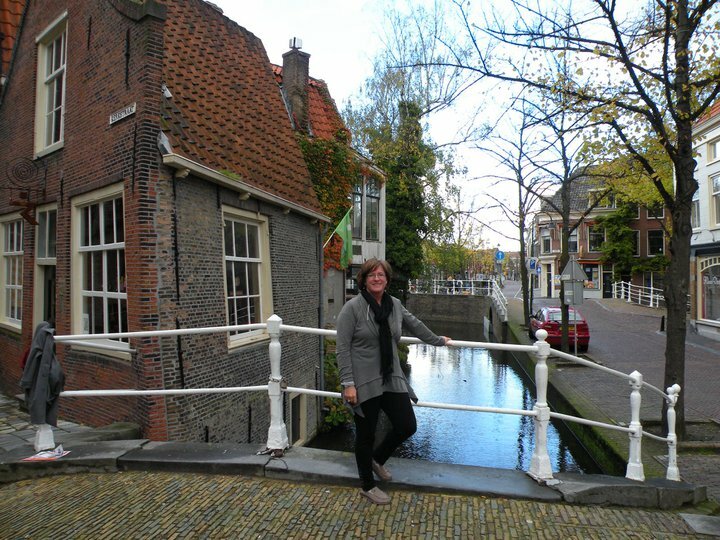 As you walk through the cobblestone streets, cross over the bridges where the canals run underneath, listen to the bells ringing from the Nieuwe Kerk and Oude Kerk, you feel that you are back in old Holland complete with the wooden shoes, blue and white ceramics, and the trademark tulips! 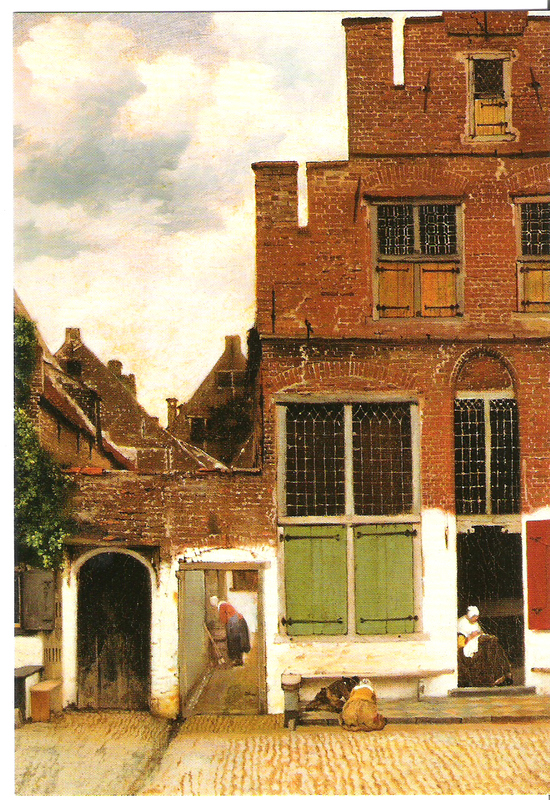 In The Little Street (1657), Vermeer depicts one of the Delft neighborhoods, possibly Voldersgracht street, and a modest home where you can see the maids going about their daily work. Notice the detail of the repainting and patching of cracks in the bricks. 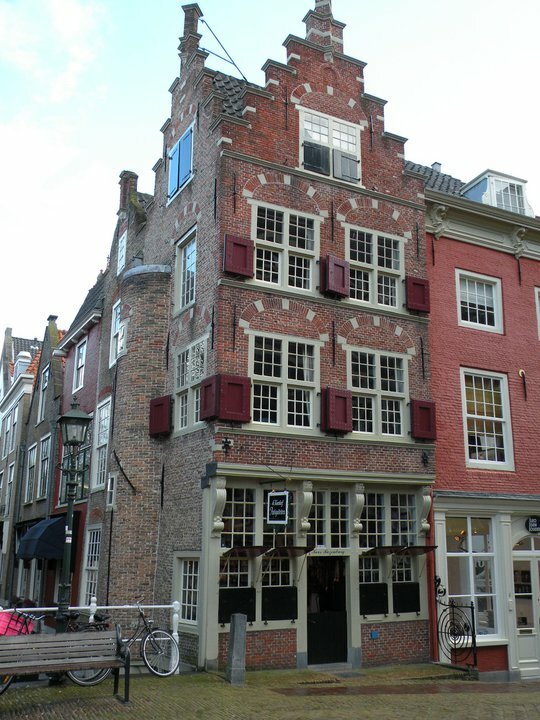 The architecture has been well preserved in Delft and you can still see homes like this today. I did find it very odd, however, that there is not one original Vermeer painting in his hometown. You can visit the Vermeer museum and see prints of his 36 known paintings, but you have to travel on to Amsterdam or the Hague to see an original. Vermeer’s most famous painting, The Girl with the Pearl Earring can be seen in the permanent collection of the Mauritshuis Museum in the Hague. This is also a town worth seeing and is only 20 minutes away by train. 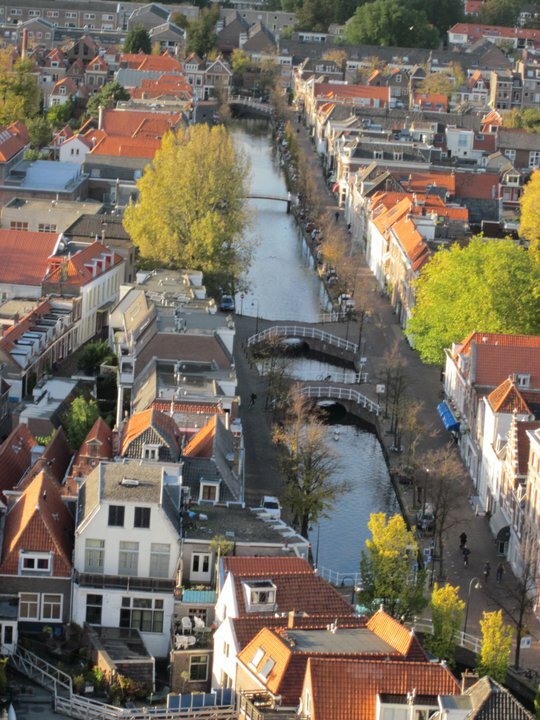 You can learn more about Vermeer’s life and his painting techniques in the movie Girl with a Pearl Earring starring Scarlet Johansson as one of his models; however, I highly recommend a personal“View of the Delft” to experience his inspiration for his paintings firsthand!